Stomach pain after eating can happen for a number of reasons such as indigestion, gas, ulcers, gastritis as well as other conditions. 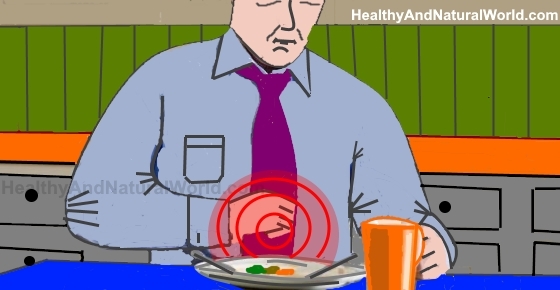 In this article I’ll get to the bottom of why many people suffer from stomach ache after eating. I’ll also cover natural remedies to help you relieve the post-meal stomach discomfort. However, you should also be aware that in many cases, an abdominal pain should be checked by your doctor, especially stomach ache every time you eat. Mealtimes are supposed to be enjoyable occasions when we can spend time with family and close friends. However, it can be very frustrating if immediately after eating, you suffer from stomach cramps, discomfort, or abdominal pain. Very often there are some simple home remedies that can help you relieve and treat the post-meal intestinal pain. Let’s look at the most common reasons for this type of pain as well as ideas on how to relieve stomach ache after eating. To relieve indigestion try to chew food slower and drink fluids after meals, not during them. Avoid lying down immediately after eating to reduce the chances of post-meal stomach issues. Eating smaller meals and cutting down carbonated drinks can also help to prevent post-meal discomfort. Stress can also make you more prone to indigestion. You can make ginger tea by chopping or grating 1 inch of ginger root and letting it steep in a cup of boiling water for 10 minutes. You should keep the cup covered. Drink this about 20 minutes before meals. You can also try these herbal teas that can help you improve your digestion. To relieve stomach pains that are caused by gas, you can try to identify which foods are causing your gas and eliminate those from your diet. Peppermint tea can help to relieve post-meal gas pain. The journal Prescrire International reported that peppermint essential oil can help to relieve abdominal pain and flatulence in patients with IBS.4 Some people find it effective to take enteric-coated peppermint oil capsules about an hour before meals to help avoid stomach cramps and gas after eating. Peppermint tea contains peppermint essential oil. To make peppermint tea all you have to do is tear a few fresh mint leaves and put them in a cup of boiling water. Cover the cup and let it stand for 5 minutes. Drink the tea to help relieve your stomach pains. To make potato juice you should peel and wash one large potato. Remove any green parts and the sprouts. Grate the potato and then squeeze out the juice. In a glass pour about 2 inches of potato juice and then fill to the top with warm water. Drink in the morning on an empty stomach. For more information, please read my article about the health benefits of potato juice. For gastric ulcers, you can drink potato juice as that helps to repair the stomach lining, reduce inflammation, and improve the digestive system. Cabbage juice is a safe and effective natural remedy for the treatment of ulcers. According to a research published in the Western Journal of Medicine, 13 patients with peptic ulcers were treated with fresh cabbage juice. The study indicated that the healing time for these 13 patients was rather fast at 10 days. Meanwhile, patients who used standard therapy took approximately 37 days to heal. Cabbage juice also has a wide range of other health benefits. Probiotics are also one of the natural remedies for the bacteria Helicobacter Pylori (H. pylori) which can cause peptic ulcers and even stomach cancer. Dr. Melinda Ratini on WebMD says that the symptoms of heartburn can be discomfort or a burning pain from your stomach to the middle of your chest.9 This happens when the muscle at the end of the esophagus doesn’t close tightly enough and some stomach acid leaks back up the esophagus. Sometimes it’s called acid reflux. To help treat heartburn and relieve stomach ache after eating, it is important to choose the appropriate diet. It’s best to avoid acidic foods like tomatoes, onions, and citrus fruits. Alcohol, fatty and fried foods, as well as spicy foods, can all cause heartburn. Also, drink plenty of water before and after, but not during your meal. In my article about the most effective natural treatments for heartburn, you can find many natural recipes to treat the symptoms of heartburn. One of these is to use apple cider vinegar (ACV) for heartburn. Mix one or 2 teaspoons of ACV in a glass of water. Drink this before meals or whenever you experience heartburn. Another option is to use baking soda to treat and prevent acid reflux. GERD is a more serious form of heartburn which can be accompanied by food coming back up into the mouth, difficulty swallowing, wheezing and chest pain. It also causes pain in your stomach after eating as well as a feeling of something stuck in the throat. Drinking baking soda water can help to treat GERD symptoms and relieve intestinal pain after eating. If you would like to find out how then please read my article on how to use baking soda to treat acid reflux. Crohn’s disease is a form of inflammatory bowel disease (IBD) which can affect any part of the digestive system. One of its symptoms stomach cramps an hour or two after eating. Crohn’s disease is also one of the reasons for having white blood cells in the stool. Because the symptoms of Crohn’s disease are similar to IBS, you could try those natural remedies to relieve stomach pain. To find out more on preventing diverticulitis, please read my article about the best home remedies for diverticulitis. A natural way to help get rid of gallbladder pain and reduce gallstones is to drink lemon water regularly. Squeeze the juice of a quarter or half a fresh lemon into a glass of warm water. Drink this first thing in the morning on an empty stomach and drink one glass in the evening. SIBO happens when there’s an overgrowth of bacteria in the small intestine which causes the stomach to bloat. It can have similar symptoms to food intolerances, candida, or a leaky gut. However, SIBO tends to cause more bloating towards the end of the day. One of the symptoms of SIBO is stomach cramps after eating. Holistic nutrition consultant, Mary Vance recommends the low FODMAP diet to reduce bloating and relieve the pain that you feel in your stomach. The low FODMAP diet eliminates certain type of foods which break down easily into sugars and continue to feed the bad bacteria in your small intestine. She has more information on the low FODMAP diet here. If you suspect you have intestinal ischemia, it is always best to visit your doctor because it requires medical procedures to restore proper blood flow to your intestines. Food intolerance can be another common reason for stomach ache after eating. Lactose and gluten intolerance are the most common types. A food intolerance means that food cannot be well absorbed or digested causing stomach spasms, pain, diarrhea or bloating. Lactose is mainly found in dairy products. if you are lactose sensitive, use milk substitutes like rice milk, coconut milk, almond milk, hemp milk, oat milk and other delicious dairy-free options. You can also make your own homemade milk substitutes. If you suffer from gluten intolerance, you will probably suffer from stomach pain every time you eat food that contains gluten. Other symptoms of gluten intolerance are diarrhea, bloating and gas. Gluten is a protein found in many grains and it’s also common in many other foods. Celiac disease (CD) is usually the only medical concern surrounding gluten sensitivity. It stems from an autoimmune response to gluten and if left untreated can contribute to malnutrition, mental illness, and diminutive body growth. There are some other practical ways that can help to ease stomach ache after eating. An abdominal massage is a great way to ease stomach cramps after eating. This only takes 2 minutes to do and it can help you effectively relieve pain. To find out how to do this and to read about its many other benefits, please read my article about the amazing benefits of abdominal massage. For this, you will need to fill a hot water bottle. All you have to do is lie on your back and place a towel over your stomach and put the hot water bottle on your stomach. The heat from the hot water bottle can help ease your stomach ache. There can be many different reasons for stomach pain after eating. If you have pain that won’t go away and that you can’t get any relief from, you should always see your doctor. 2. Antioxidative and anti-inflammatory effects of ginger. 3. Gas causes and treatments. 4. Herbal remedies for dyspepsia – peppermint seems effective. 6. Health benefits and cons of solanum tuberosum. 8. Probiotic mixture accelerates gastric ulcer healing. 10. What is the treatment for GERD? 12. Peppermint oil for the treatment of IBS. 13. Aloe vera in treatment of IBS. 16. Gallstones and gallbladder disease.